Email best practices are very important to us. That’s why we’re constantly updating our blog with the latest and greatest tips and ideas for successful email marketing. 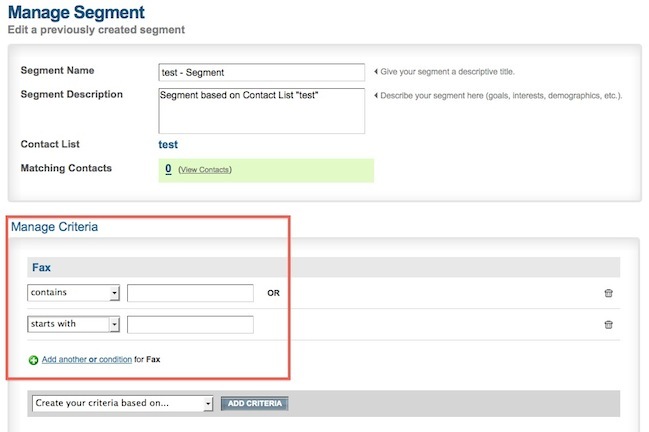 One of the most important aspects of email sending is list segmentation. We stepped up our list segmentation game so you could too. Whereas before you could only have “AND” criteria, now you can differentiate with both “AND” and “OR” criteria. This allows you to hone your segments even further. This will help with your personalization efforts and your email marketing success as a whole. To access these new segments, log into your Benchmark Email account. Then go to the Lists tab and click on the Segments option. Fill in a name for the segment, a description, and then select which list you would like to create the segment in. Hit Save & Continue when you are finished. The next step is to Add Rules / Criteria to the segments. Use the dropdown menu to choose what criteria you would like to add and click Create Criteria. Then you will be able to Manage Criteria. For example, say you wanted to segment based on the date a subscriber was added to your list. First you will choose the Date Added criteria and then whether you want the segment to be Before, On or After a specific date. Hit Save and Refresh Count when you are finished. These rules can be combined in any number of ways to help you hone in on your segments as much as you wish. Not all criteria may be available for every field or list. You can also add multiple rules for the same field, such as “email contains yahoo” or “email contains hotmail.” That way all your subscribers will be able to receive the best looking, most accurate emails for them. I ma so keen to do the email marketing but earnestly, I stil can not get. My plea is that you give me more helping hands. Dennis- Our guides and manuals are a great place to find more assistance. Follow us Twitter as well (@BenchmarkEmail), for tons more great information.